On Saturday, December 2, the Club will be hosting its first meet of the season for all ages and abilities of skaters. The Ability Meet Information Flyer and Registration Form can be found on our events page. You can fill out the registration form on your computer and email it to ykspeedskating@gmail.com or if you prefer you can print it out and give it to Jody, Myra or Karin. Deadline to register is Sunday, November 19. The registration fee of $20 (Rockets are FREE!) can be sent via EMT to ykspeedskating@gmail.com. Please be sure to use the password “yellowknife” and indicate which skater your transfer is for. If you prefer, cash or cheque (make out to YKSSC) can be given to Jody, Myra or Karin. Many volunteers are required to run this meet (set-up, timing, recording, lap-counting, water, runners, etc) so we need your help! Training and direction will be provided. If you are able to help, please email Martin. If you are interested in being the Food Coordinator, please email the Ability Meet Coordinator (Jody). Speed Skate Canada has designated Sunday, December 10 as National Skate Day! To celebrate this Canada 150 event, we will be holding a free public skate with games and other fun activities on the ice. THIS EVENT HAS BEEN POSTPONED. Sorry for the inconvenience. We will reschedule this fun day in the near future. We wanted to highlight a great achievement from one of our Competitive Skaters, Wren Acorn, earlier this month in Calgary. 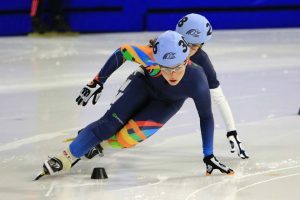 Wren was in fine form both on and off the ice skating two rounds of 500≥m races and 1 round of 1500m. Competing with many western Canadian skaters, plus development team members from Japan and the US, made for some exciting races and great learning. Wren achieved a new personal best in the 500m race! Photo credit: Calgary Olympic Long Track coach Arno Hoogveld. YKSSC will be hosting a skater/coach clinic in November (date TBC) where renowned coach Debby Fisher will be on ice for all group levels to help our coaches become better coaches and also to help our skaters become better skaters! There is no fee for the clinic and the skaters just need to attend their regular program times. When parents bring skaters to the rink, it is important to please help put out the mats (depending on the level) to be as efficient as possible and to allow our skaters to maximize their ice time. We also request that parents (or a designated adult) stay to watch their skaters in case their child requires attention due to injury. The coaches cannot fully tend to injured skaters with other skaters present on the ice. And you’ll want to cheer on your skaters! 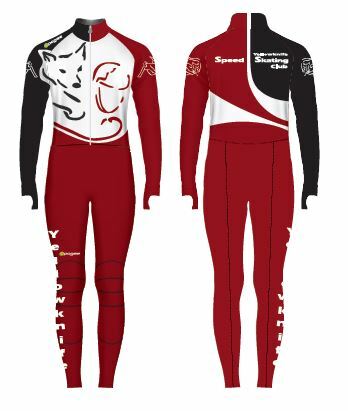 For the first time ever, YKSSC has ordered locally designed club suit to its skaters. Not only does this opportunity make our skaters look and feel good during practice, it also brings them together at tournaments away from home. A HUGE thank you to Alexandre for designing and spearheading the order with Apogée. Suits are expected to be here in early November. We are back with a great season planned for our skaters! In order to streamline processes and reduce administration costs, YKSSC has eliminated the option of PayPal. Sorry for any inconvenience this may cause. The easiest way to register is with the online registration form. All skaters must be registered before getting on the ice. E-transfer the funds to ykspeedskating.regs@gmail.com. Please use the password “Yellowknife” in your transfer and please include the skaters name and program you registered for in the message. Cheque, payable to Yellowknife Speed Skating Club. For registration questions, please contact Myra at ykspeedskating.regs@gmail.com. Please refer to our Schedule for more information. We have a variety of Club speed skates to rent in sizes to fit SSII skaters and up. We also have limited smaller sizes suitable for SSI although they are not required at this level. The rental fee is $125 for the season plus a damage deposit of $125 (to be returned at the end of the season). Skates are rented from our locker room at the Multiplex (back room of the Ed Jeske ice surface). Please contact ykspeedskating@gmail.com if neither of these scheduled times work and you need to make other arrangements. Safety Equipment is a Must! A variety of safety equipment is required for each skater depending of their program level. A full equipment list for each program is listed on the individual program pages. For more information about appropriate safety equipment, visit Speed Skate Canada. There are various places online you can purchase certified safety equipment. Visit our Equipment page for links and more information. Closer to home, Overlander Sports in Yellowknife typically brings in a selection of certified helmets, safety glasses, cut-proof gloves and more at the start of the season for our skaters! We also have a Used Equipment Swap Shop where you can find deals on various types of speedskating equipment from skates to skinsuits! If you have something to sell, let us know!